This section helps you understand your benefit amounts and the payment options the Plan offers in your Benefit Election Packet. It describes what you need to know when making your pension choices. It also contains important retirement information such as automatic bank deposit and tax withholding. Your Plan offers several choices on how your retirement benefits are paid. There are three main types of benefit payment options explained in this section. The first two payment options above provide a continuing benefit to your spouse upon your death. The third payment option provides a benefit for your lifetime only. 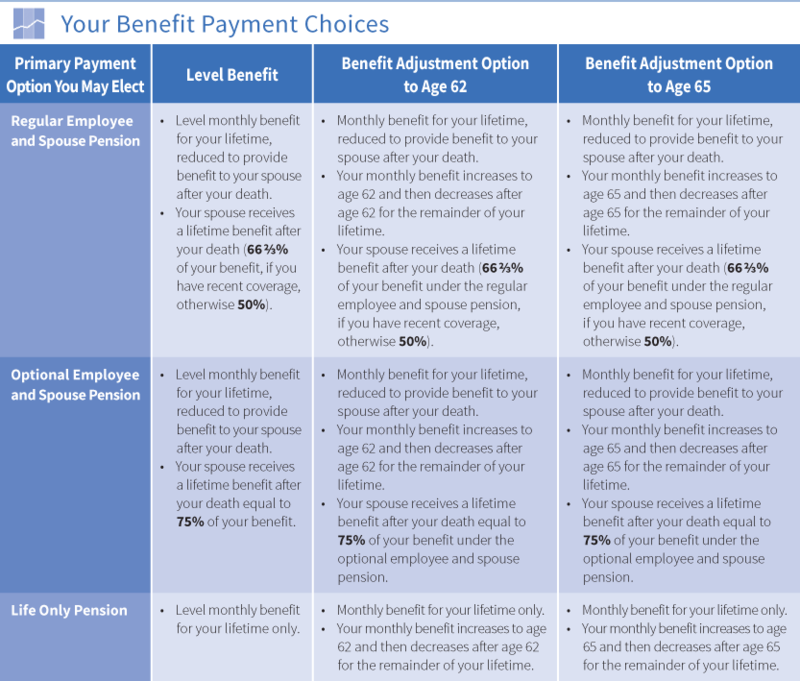 In addition, you can further customize your benefit payment under each of these benefit options. You may choose a level benefit payment for your lifetime. Or you can choose to receive a larger benefit up to age 62 or age 65 and then smaller benefit after that date. These additional choices are called the benefit adjustment options. Click here to see the three primary types of payment options. Next to each, you can see how the benefit is paid if you also choose to include the benefit adjustment option. After you apply for retirement benefits, your Administrative Office sends you a Benefit Election Package that contains your Benefit Election Packet and other materials. Use your Benefit Election Form to choose how you want your benefit paid and to confirm your pension effective date. The packet explains the benefit payment options available to you and the procedures you must follow to choose the benefit payment option you want. If you are married, your spouse’s written consent to your choice of payment option and pension effective date is required. You must complete and return the Benefit Election Form (and the Spousal Consent Form if required) to your Administrative Office before benefits can begin. Remember, it usually takes about three months to process your application before you receive your first benefit payment. The sections that follow explain all of your Plan’s payment options. The life only pension pays a set monthly benefit for your lifetime only. The monthly benefit amount stops at your death. No lifetime benefits continue to your spouse or beneficiary after your death. If you have recent coverage when you retire, your Plan beneficiary may qualify for a four-year certain death benefit. Also, if you choose the optional lump sum death benefit at retirement, your beneficiary receives that benefit after your death. Single—If you are single on your pension effective date, your benefit is automatically paid this way (unless you choose another form of payment listed on your Benefit Election Form). Married—If you are married, you can choose the life only pension instead of an employee and spouse pension as long as your spouse provides written consent. The life only pension with benefit adjustment option is available if you are eligible for early retirement. This benefit payment option is not available if you are taking disability retirement before your earliest retirement date (usually age 55). If you choose to add the benefit adjustment option, you receive an increased life only pension until age 62 or age 65, whichever age you choose. 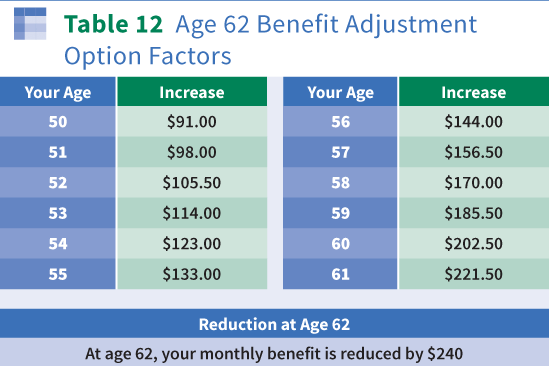 The actual increase depends on your age on your pension effective date and whether you want the increase to stay in effect until age 62 (See Table 12) or age 65 (See Table 13). If you choose this option, the monthly benefit you receive after age 62 or age 65 is reduced. If you choose age 62, your monthly benefit is reduced by $240 at that age. If you choose age 65, your monthly benefit is reduced by $300 at that age. If you choose the life only pension with benefit adjustment option, you receive a monthly benefit for your lifetime only. The monthly benefit amount stops at your death. No lifetime benefits continue to your spouse or beneficiary after your death. Single—If you are single on your pension effective date, you can choose the life only pension with benefit adjustment option, if available, instead of the life only pension. Married—If you are married, you can choose the life only pension with benefit adjustment option, if available, instead of the employee and spouse pension (explained next) as long as your spouse provides written consent. Table 12 and Table 13 show a partial list of adjustment factors. They also show the minimum increase you can expect. In some cases, the increase may be greater if required by Internal Revenue Service regulations. The adjustment factor that applies depends on your age in years and completed quarter-years on your pension effective date. If your exact age is not shown, contact your Administrative Office for the factor that applies to you. Special rules apply if your increased pension until age 62 is less than $265 or if your increased pension until age 65 is less than $325. Contact your Administrative Office for details. If you are married on your pension effective date, your retirement benefit is paid as a regular employee and spouse pension—unless you choose another form of payment during your benefit election period and your spouse consents to your election. The Plan offers two forms of employee and spouse pension—regular and optional. Under either form, you receive a monthly benefit for your life that is less than you would receive under the life only pension. If you die before your spouse, a portion of your reduced monthly benefit is paid for the rest of your spouse’s life. The benefit your spouse receives is called the spouse lifetime pension. The reduction in your lifetime benefit depends on your age and your spouse’s age on your pension effective date and whether you choose the regular or optional employee and spouse pension. Under the regular employee and spouse pension, the reduction in your benefit is not as great as under the optional employee and spouse pension. The benefit payable to your spouse depends on whether you have recent coverage when you retire. If you have recent coverage at retirement, your spouse receives 66 2/3% of your monthly employee and spouse pension. If not, your spouse receives 50% of that amount (as shown in Table 14). Remember, while you are alive, your spouse does not receive any benefit payments. Under the optional employee and spouse pension, the reduction in your benefit is larger than under the regular employee and spouse pension. Your spouse receives a larger benefit after your death, equal to 75% of your monthly benefit under the optional employee and spouse pension. The reduction in your benefit depends on whether you have recent coverage at retirement. Table 15 shows the percentage of your life only pension you receive if you choose the optional employee and spouse pension. Use the top chart in Table 15 if you have recent coverage; otherwise use the bottom chart. The regular or optional employee and spouse pension with benefit adjustment option is available if you are married and eligible for early retirement. This benefit payment option combines features of both the life only pension with benefit adjustment option and the employee and spouse pension. This benefit payment option is not available if you are taking disability retirement before your earliest retirement date (usually age 55). With the benefit adjustment option, you receive an increased employee and spouse pension until age 62 or age 65, whichever age you choose. The first step is to calculate your monthly benefit amount under the regular or optional employee and spouse pension without the benefit adjustment option. Then calculate the increase in your monthly benefit under the benefit adjustment option. 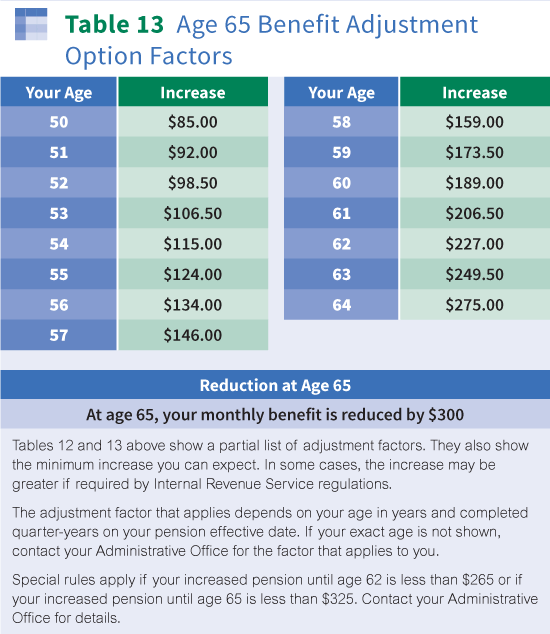 The increase depends on your age on your pension effective date and whether you want the increase to stay in effect until age 62 (See Table 12) or age 65 (See Table 13). If you choose the benefit adjustment option, the monthly benefit you receive after age 62 or age 65 is reduced. If you choose age 62, your monthly benefit is reduced by $240 at that age. If you choose age 65, your monthly benefit is reduced by $300 at that age. The employee and spouse pension with benefit adjustment option provides your spouse with a lifetime benefit if you die first. The amount of your spouse’s benefit is determined as if you chose the employee and spouse pension without the benefit adjustment option and depends on whether you have recent coverage at retirement. If you choose either form of the employee and spouse pension with the benefit adjustment option, you can also choose the optional lump sum death benefit so your Plan beneficiary receives a death benefit after your death. (See Employee and Spouse Pop-Up below for more details). If you have recent coverage at retirement, your spouse receives 66 2/3% of your monthly regular employee and spouse pension without the benefit adjustment option. Otherwise, your spouse receives 50% of that amount. Remember, while you are alive your spouse does not receive any benefit payments. Your spouse receives 75% of your monthly optional employee and spouse pension without the benefit adjustment option. Remember, while you are alive your spouse does not receive any benefit payments. If you choose the regular or optional employee and spouse pension (with or without benefit adjustment option) and your spouse dies before you, your monthly benefit increases for the rest of your life. This feature is called a Pop-Up. Your monthly benefit increases or pops up on the first of the month following your spouse’s death. When this Pop-Up occurs, your monthly benefit increases to the amount you would have received under the life only pension. If you choose an employee and spouse pension with benefit adjustment option, your benefit increases to the amount you would have received under the life only pension with benefit adjustment option. Since the Pension Trust won’t necessarily know about your spouse’s death, notify your Administrative Office as soon as possible. You need to provide a copy of your spouse’s death certificate. 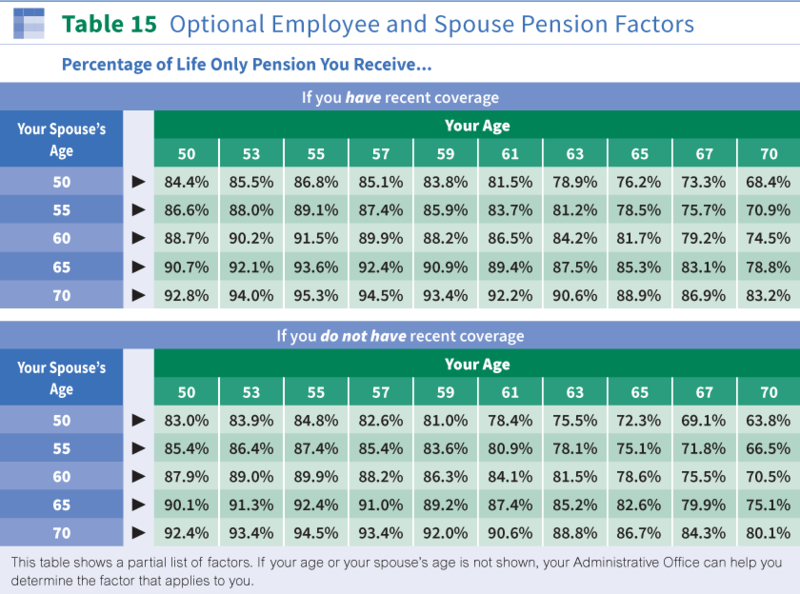 If you die first, your spouse receives a portion of your employee and spouse pension as shown in Table 9. If you marry or remarry after your pension effective date, your new spouse does not qualify for a spouse lifetime pension. If you choose an employee and spouse pension and later divorce, your employee and spouse pension stays in effect. Your former spouse remains the person who receives the spouse lifetime pension after your death. This rule may not apply if a court enters a Qualified Domestic Relations Order (QDRO) that provides for conversion of your employee and spouse pension to a life only pension and certain other requirements are met. Contact your Administrative Office for details. Click here for more information about Qualified Domestic Relations Orders. You can choose this benefit payment option when you retire so your Plan beneficiary is assured of receiving a lump sum benefit payment when you die. This death benefit is equal to 12 times the monthly benefit you receive if you choose the life only pension without benefit adjustment option. Your monthly benefit (and any benefits based on it) is reduced by a small percentage to provide for this death benefit. The actual reduction depends on your age on your pension effective date. Click here to see the Optional Lump Sum Death Benefit Factors in Table 16. If you are married on your pension effective date, you can choose this optional lump sum death benefit as long as your spouse provides written consent. You can choose the optional lump sum death benefit along with any other available benefit payment option. You do not have to choose the life only pension to provide this death benefit. If you do not choose this death benefit, no optional lump sum death benefit is paid to your Plan beneficiary after your death. Assume you are age 62 when you retire and your life only pension is $1,500 per month. 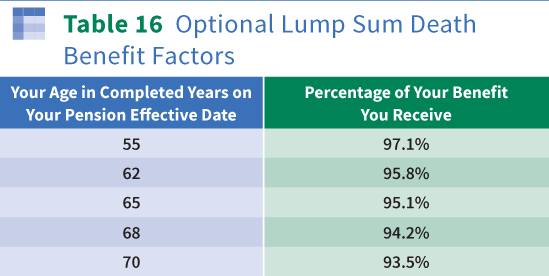 You choose the optional lump sum death benefit and want to know how this affects your monthly benefit. Your death benefit factor from Table 16 above is 95.8%. 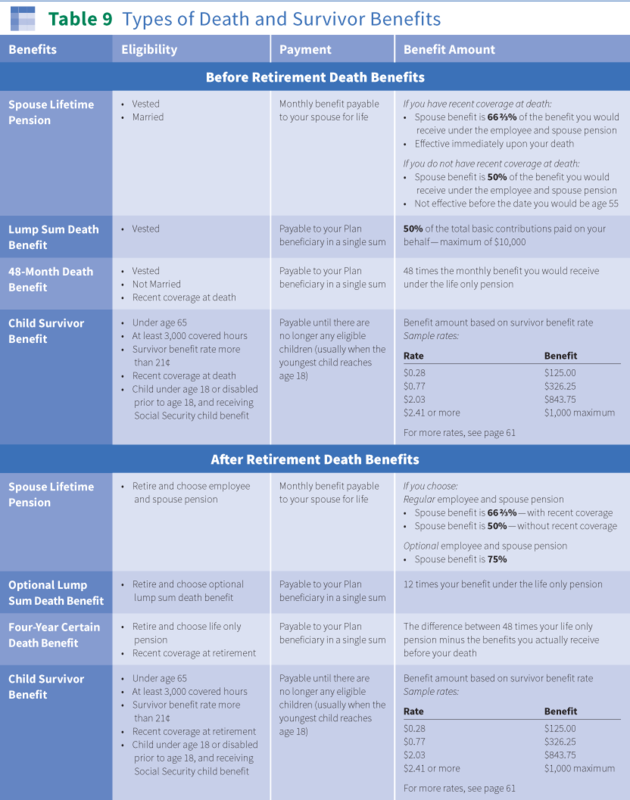 Your life only pension with the death benefit option is $1,437 (95.8% times $1,500). At your death, your Plan beneficiary receives an optional lump sum death benefit of $17,244 (12 times $1,437). Filing your retirement application with your Administrative Office is just the first step in the retirement process. Once Plan representatives verify your retirement eligibility, you are sent a Benefit Election Packet containing your personalized Benefit Election Form. Your Benefit Election Form shows the actual benefit amounts payable under each available payment option based on your age and marital status on your pension effective date. In general, the total payments to you and your spouse and/or Plan beneficiary under all of your payment options are calculated to be of approximate equal value (relative value). Your Benefit Election Packet will explain in more detail the relative value of the benefit payment options available to you when you apply for retirement. You can also contact your Administrative Office if you have questions. Your Benefit Election Packet also contains other forms that you and your spouse (if married) need to complete and explains how to complete each form. How you would like your lifetime monthly retirement benefit paid. If you would like to provide a death benefit to your beneficiary. The name of your beneficiary. Whether or not you wish federal or state income tax withheld from your benefit. Your spouse agrees to the pension effective date you choose. If you choose a life only pension, your spouse confirms that no monthly benefits continue after your death. If you choose an employee and spouse pension, your spouse confirms that the spouse lifetime pension is greater if you choose a later pension effective date. If you choose an employee and spouse pension with the optional lump sum death benefit, your spouse confirms that the spouse lifetime pension he or she receives is reduced to provide for the optional lump sum death benefit. The Spouse Consent Form must be completed and signed in the presence of a notary public or an authorized employee of an Administrative Office. If you or your spouse have questions about this form, contact your Administrative Office. After you complete the Benefit Election Form, you may decide to change your previous election. If you wish to change or cancel your prior election, a written request for the change must be submitted to your Administrative Office before the end of your benefit election period. Your benefit election period ends 90 days after the issue date of your first benefit check. You receive formal notification of the exact date on which your benefit election period ends with your first benefit check. Once your benefit election period ends, you won’t be allowed to make any further changes. You may change your benefit payment options. You may change your pension effective date. You may cancel your retirement application. Also, within your election period your spouse may revoke consent to the form of pension payment you elected. To make any of the changes listed, your request must be made in writing and received by your Administrative Office within your benefit election period. If you are married, your spouse’s consent to any changes must also be received by your Administrative Office within your benefit election period. If your request is made after that date, or if your Administrative Office does not receive your written request, and your spouse's consent if applicable, within your benefit election period, your request is denied. If you submit a request to cancel your retirement application within your benefit election period, you must pay back any benefit payments you have received before your request can be approved—or make repayment arrangements satisfactory to the Trustees. Once your cancellation request is approved, you are treated as if you never submitted a retirement application. Any approvals of your application are revoked, as are any elections you made and any spousal consent to your elections. If you decide to retire later, you must start the application process all over again. Carefully review the letter accompanying your initial benefit payment, paying special attention to the date when your benefit election period ends. Usually, your marital status on your pension effective date determines if you can choose an employee and spouse pension and if the consent of your spouse is required for the choices you make. Special rules apply if your marital status changes during the period between your elected pension effective date and the date you receive your first pension payment. For example, if you and the person you are married to on your pension effective date divorce before you receive your first pension payment, that person is no longer considered your spouse for any Plan purposes. You may not choose an employee and spouse pension with that person unless the Plan receives a Qualified Domestic Relations Order (QDRO) requiring that you do so. As another example, if you marry someone after your pension effective date but before you receive your first pension payment, your new spouse is the person who must consent to your choice of a pension effective date and benefit payment option. However since you were not married to that person on your pension effective date, you cannot choose an employee and spouse pension with that person unless you delay your pension effective date until the first of the month following your marriage. Also, that person must consent if you want to keep your original pension effective date with a life only pension. These special rules may apply to other changes in marital status around the time of your retirement. If your marital status changes while your retirement application is being processed, or if you anticipate that your marital status may change during this period, notify your Administrative Office immediately. Then they can explain how that change may affect your retirement benefit. Most participants receive retirement benefits as monthly pension amounts. If the total value of your expected lifetime benefits is $5,000 or less, you receive the value of your benefits in a single payment rather than as a monthly payment. If the total value of your expected lifetime benefits is between $5,000 and $10,000, you can choose (with your spouse’s consent, if married) to receive the value of your benefits in a single payment rather than as a monthly payment. If you receive the value of your benefits in a single payment, you may be eligible to roll over a portion or all of your single sum payment into an Individual Retirement Account (IRA) or an Eligible Employer Plan. If you are age 70 or over on the distribution date of your payment there re federal tax rules that limit the amount eligible for a rollover. The Administrative Office will review your record and advise you if these rules apply and, if so, what portion of your benefit is eligible for a rollover. You will receive forms with your Benefit Election Packet further explaining these rules. If your benefit is paid in a single payment, no further payments are made to you or your survivors. IRS rules state that your spouse must consent to all elections you make during the retirement application process. When you near retirement, it’s important that you keep your Administrative Office informed of changes in your marital status. This allows Plan representatives to correctly inform you about documents your spouse may be required to sign. Here are some items to keep in mind whether you are just applying for retirement or have already begun receiving your benefits. Your Plan offers a free service to directly deposit your monthly check with your bank or other financial institution. Payments are electronically transferred directly to your bank, avoiding delays in the mail service. You don’t have to worry about depositing your benefit check since it automatically goes to your bank account by the first of the month. This saves you a trip to the bank and ensures your check is deposited even when you are out of town. Lost or stolen checks are avoided since they are not sent by mail. You may choose this automatic bank deposit service by attaching a copy of a voided check with your retirement application. You always have the option of changing your bank or opting out of direct deposit if you decide later that you prefer to receive a paper check. If you request automatic deposit, your first benefit payment is automatically sent to your bank and you’ll receive a letter in the mail, confirming the amount of your first payment. If you do not request automatic deposit, your first benefit payment is mailed to your home address. Under federal tax law, benefit payments are subject to federal income tax withholding unless you choose otherwise. At retirement, your Administrative Office sends you a Benefit Election Packet that contains the forms you use to make your retirement decisions. Your Benefit Election Packet also contains Internal Revenue Service forms including the Withholding Election Form. Use this form to choose whether you want federal income tax withheld from your monthly benefit payment. Before completing this form, be sure to review the Internal Revenue Service Notice to Payee of Withholding of Federal Income Tax from Periodic Pension Payments. Then send your completed Withholding Election Form back to your Administrative Office (not to the Internal Revenue Service). If you live in a state where you are subject to state income tax, you must also complete a State Income Tax Withholding Form (included in your Benefit Election Packet). Contact your tax advisor with questions about how much to withhold or how your Plan benefits should be reported to the Internal Revenue Service each year. By January 31 each year, your Plan sends all retirees and beneficiaries Internal Revenue Service Form 1099R. This form shows the total amount you received from the Plan during the past calendar year. It also shows the amounts of any federal or state taxes withheld from your benefits that year. Prudential Financial automatically sends you a statement twice each year showing the total benefits you received for the prior six-month period. After you retire, it’s important to keep the Plan informed of changes in your home address. If your pension check is mailed to your home and you move, it may take up to two months before your check is mailed to your new address. Contact Prudential Financial at their toll-free number (800) 336-3387 as soon as you know your new address. If your pension checks are automatically deposited with your bank, it’s still important to keep the Plan advised of any changes to your home address. Plan updates and your annual Internal Revenue Service Form 1099R or Form 1042S are mailed to your home address. If your benefit checks arrive by mail, they may not always get there by the first of the month. If your check is late, wait until the fifth of the month before contacting Prudential Financial. You can call their toll-free number at (800) 336-3387. If you lose your check or know that it is stolen, call immediately. Click here for questions and answers about how benefits are paid. You may wish to make changes to your tax withholding, direct deposit or mailing address after you retire. You can call Prudential Financial at (800) 336-3387 or visit their website at wctpension.retirewithpru.com. View and print your 1099-R tax statements. Change your federal and state tax withholding elections. Set up or change direct deposit information. View up to 24 months of payment history. View and print a verification of income letter for pension payments.